Last week during a visit to see my family in Seattle, I stopped by at the University of Washington and ran a small workshop for design students on making career decisions. I graduated from UW's industrial design program and I very much enjoyed hearing guest speakers from all backgrounds when I was a student. Now that I've been working for a few years, I thought it would be great to give back in some way. 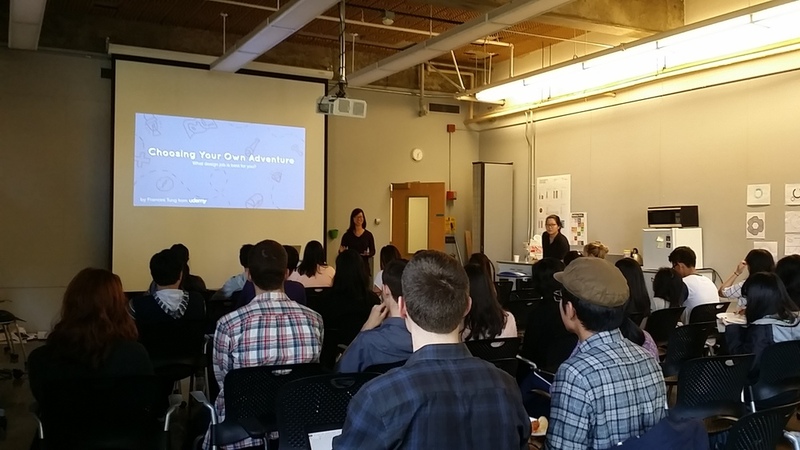 With the help of student leadership from UW IxDA and Women in Informatics, I put together a mini workshop and lecture titled Choosing your own adventure: What design job is best for you? I put together 10 questions which I thought were important to ask yourself when job hunting, such as "What industries are you interested in?" and "What kind of lifestyle do you want"? I asked the students to reflect on these questions and write down what came to mind. Then, I shared some general opportunities and challenges that come with working at either a small or larger company. Reflecting back on my own experiences contracting/interning/working full-time at different companies, I shared 6 stories that illustrated the pros/cons of different workplaces. It was a fun presentation to put together and I got plenty of great feedback from the Udemy design team along the way. All of us thought back to our student days and reflected on what kind of advice we would give our past selves if given the chance. Two of my coworkers, Pablo and Claire, also helped me put together some awesome swag just for the occasion! As I do more of this kind of stuff in the design community, the more I realize how far I've come and also how much farther I have to go. These talks take up an enormous amount of time and energy for me to put together (even though the presentation was only for an hour), but it has been great experience for me to build my voice and get out of my comfort zone. I definitely plan on doing more!